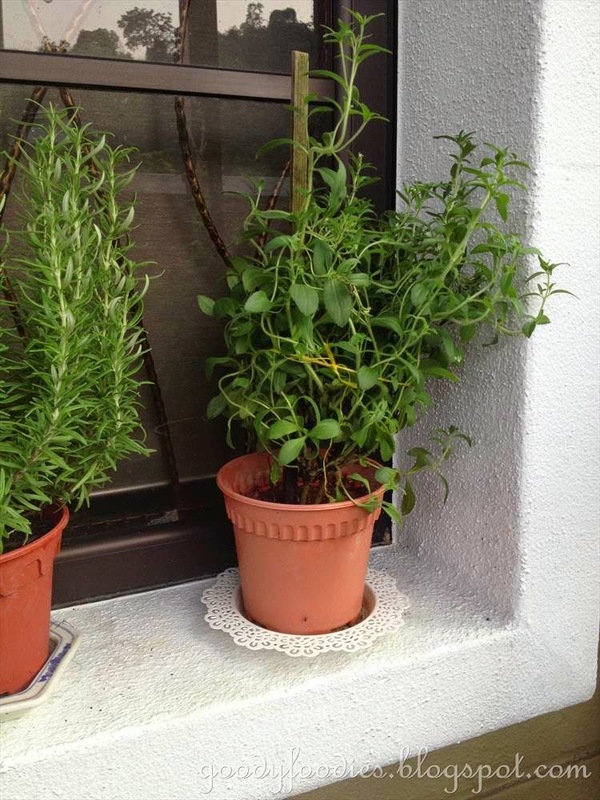 Last year, I started a herb garden - something I have been meaning to do for a while. I managed to source quite a lot of herbs in KL. Most of these herbs require little direct sunlight (needs to be quite shaded in fact). Most of them survived and are still thriving, and have made an appearance in many of my homecooked dishes. I have also planted some fruit plants, always excited when the plant bears some fruits for us to enjoy. I have also recently added a few edible flowers to my collection. 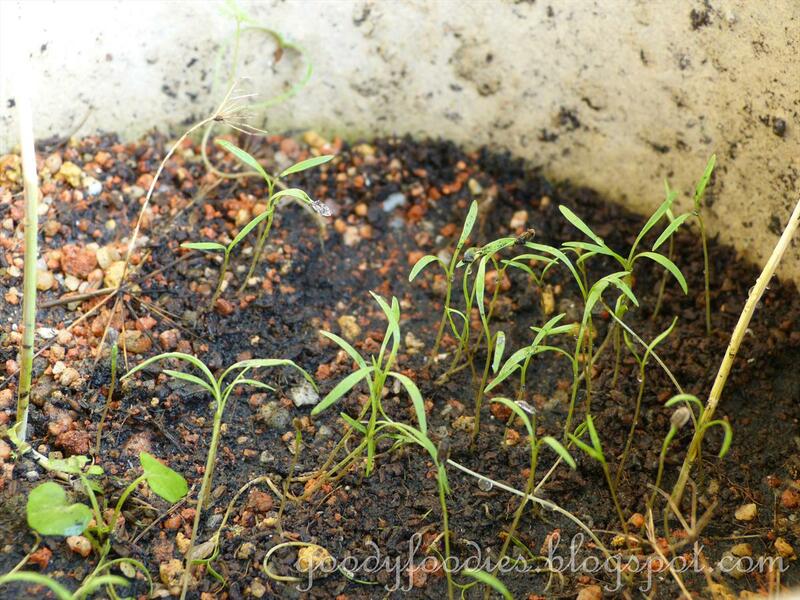 You can also read this post about how to make your own compost at home. Rosemary is a useful herb to have in the garden. I use it a lot when I'm roasting potatoes and meat. It is said that eating rosemary can improve memory. 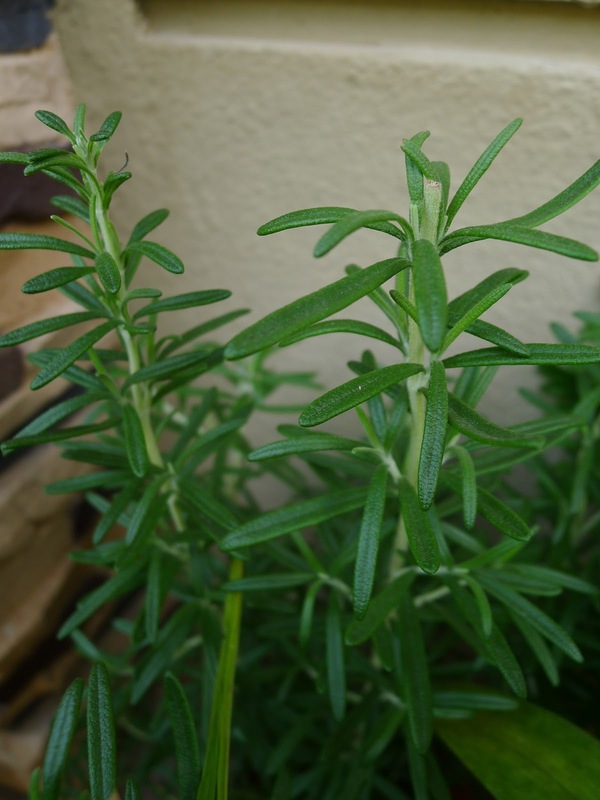 Rosemary requires watering once everyday, if it is a very hot day, you may want to water in the evenings as well. Avoid watering on the plant leaves. This herb requires direct sunlight, and is one of the easier ones to grow in Malaysia. 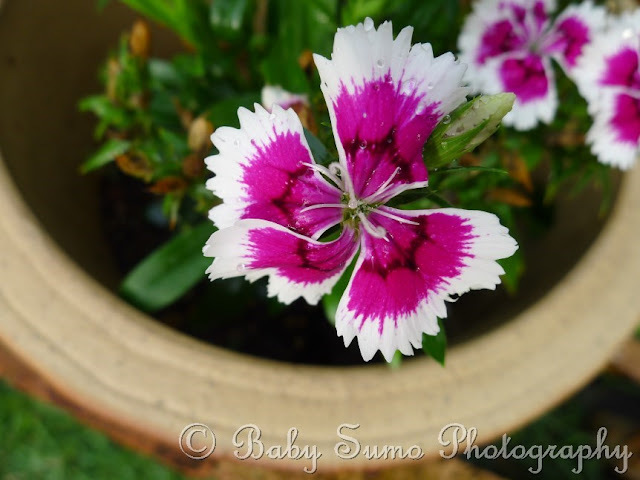 I bought this peppermint plant for fun, cos it was available. So far I've only used it to make peppermint tea (add the peppermint leaves to some black tea). I do love the smell a lot, the aroma is said to be able to enhance memory and alertness. It can soothe and treat nausea, vomiting, abdominal pain, indigestion, irritable bowel, and bloating. 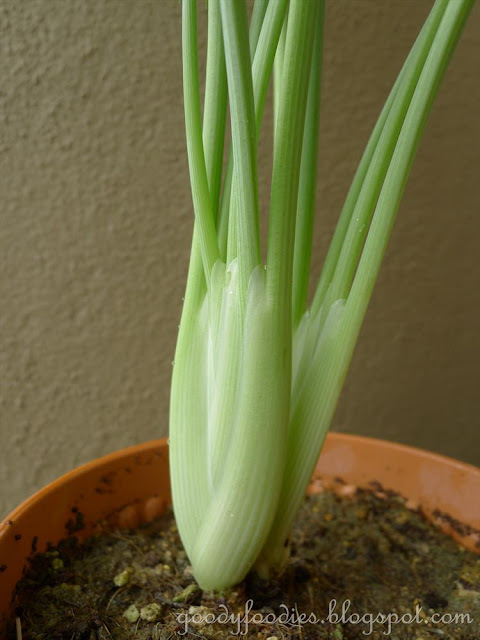 You can grow it easily by cutting off a stem and placing it in water to grow roots. This herb needs to be kept out of the hot sun and water moderately once daily. 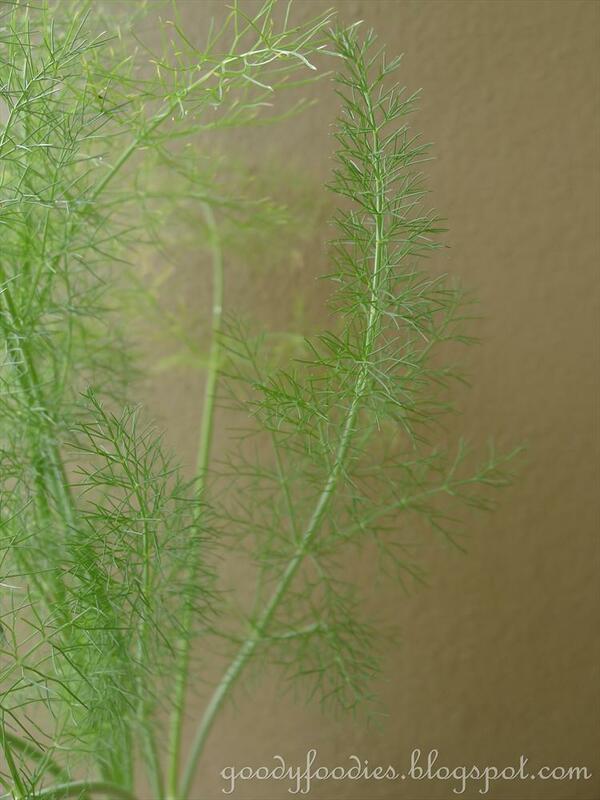 Dill is also known as Lao Coriander. 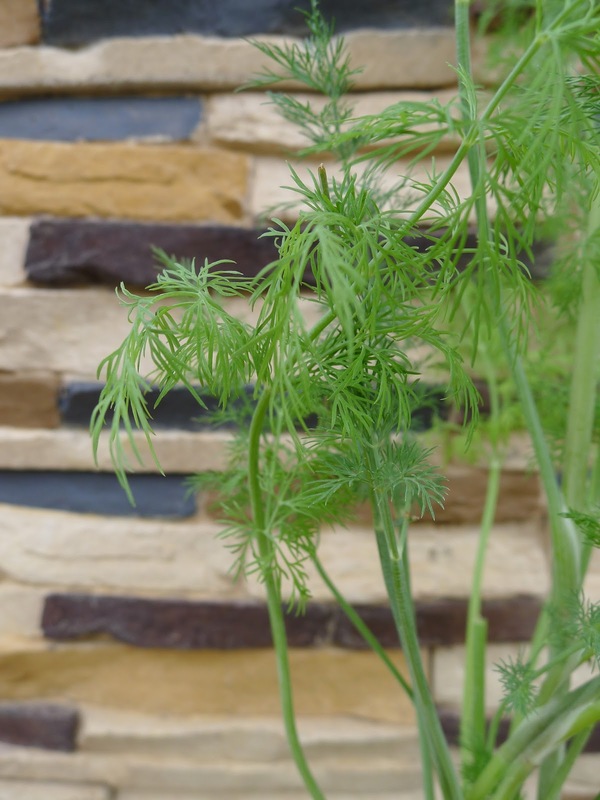 Dill can grow up to 40-60cm, you will need to support it with a stick to help it grow straight. The leaves are delicate (thread-like) and have a lovely fresh smell. It is said that dill have calming properties as well as being able to reduce pains and aches, prevent bad breath, helps digestions and relieve bloating, burping and insomnia. One evening, while we were in the garden, my kids started picking off the leaves and eating them... telling me that it was very nice! 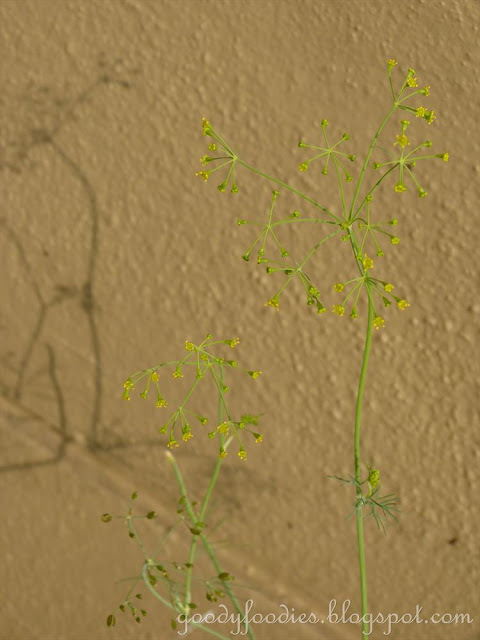 My dill plant has recently been flowering a lot (the flowers are yellow), I waited til they are quite dry, then just cut them off and sprinkle the seeds over soil in a new pot. After 2-3 days, the"babies" emerged. So happy! Dill requires direct sunlight exposure and good drainage. Water 2 times a day to avoid dryness. I like to use dill with eggs as well as with cucumber. Can you see the seed? It's beginning to have leaves! If you ask me what is my favorite herb from the garden, my answer will be this sweet basil plant. 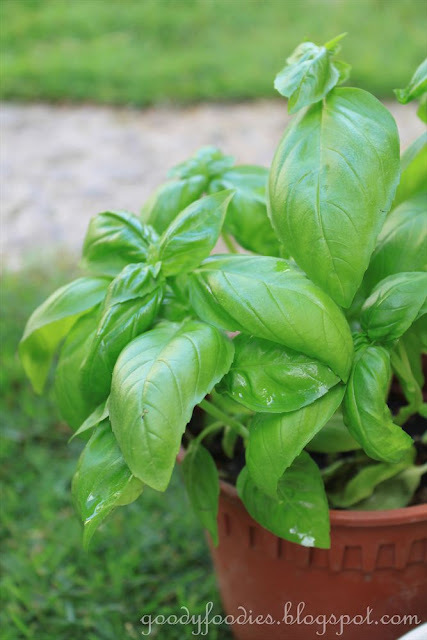 It is very useful and versatile, I love adding it to pasta and when I make a big harvest, I will make homemade pesto. It pairs really well with tomatoes or even strawberries and my kids love to eat it raw/fresh- just pluck and eat! I have 5 basil plants now (started off with 2), they grow quite easily. 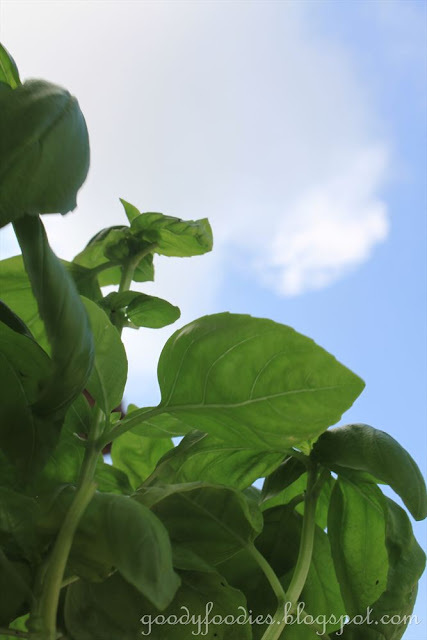 When the basil plant grows quite tall, you can trim it and any trimmings can be placed in water for a few days for it to grow roots. Once the plant has new roots, you can plant it in a new pot. They are quite prone to insects though, so keep an eye on them - I usually use an organic insecticide to keep the insects away. Water sparingly two times daily but avoid the leaves. In Malaysian climate, I would say it needs moderate sunlight so keep semi-shaded but within reach to sunlight. 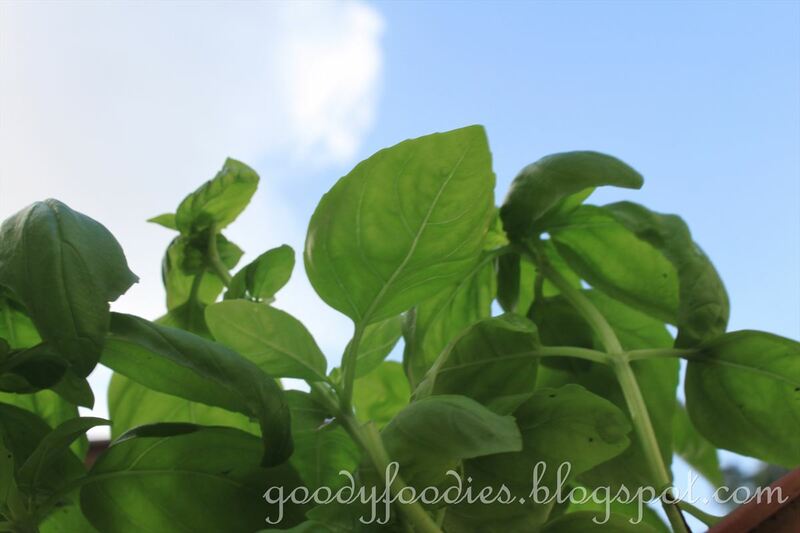 Holy basil is great in Thai dishes such as pad krapow moo. It is easy to grow, requiring full sun and good drainage. 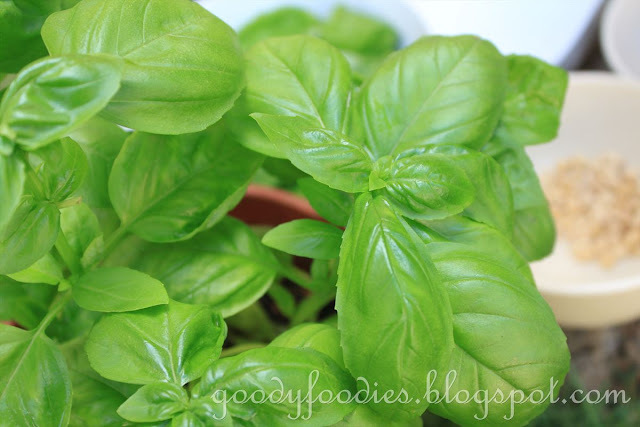 The leaves are serrated and is retains its fragrance better than Thai basil when cooked. 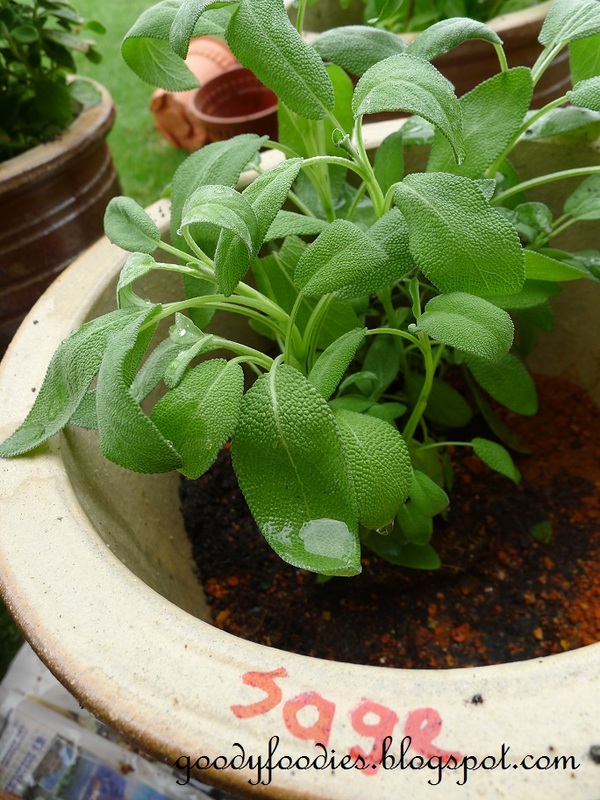 Sage is commonly used for its culinary and medicinal properties; its name comes from the Latin word salvere (to save). It is a strong flavoured herb and the leaves are slightly bitter. You can use it with pork (such as to make meatballs) as well as pair it with pumpkin. It can also be used to make this natural cough-control tea. Sometimes sage is used to reduce the greasy taste of meat ("sou mei"). It has calming effects and can aid digestion. Sage trimmings can be placed in water for new roots to grow. 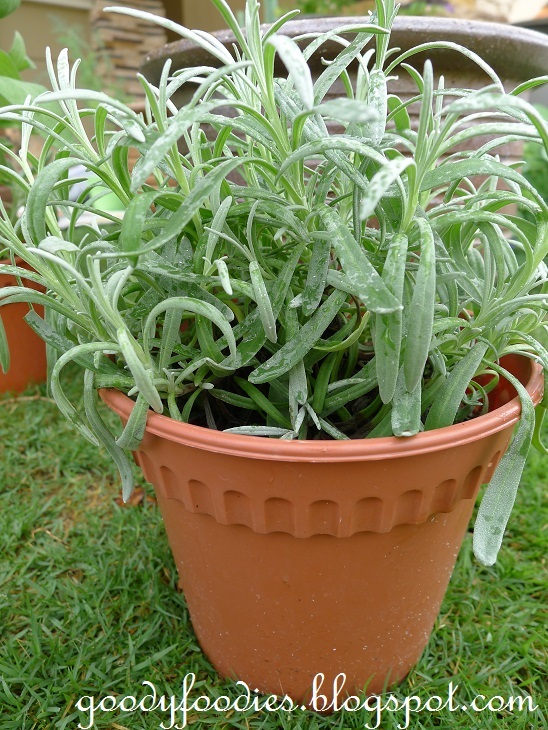 Sage plant requires plenty of water but prevent excessive watering at foliage. It requires partial sunlight. 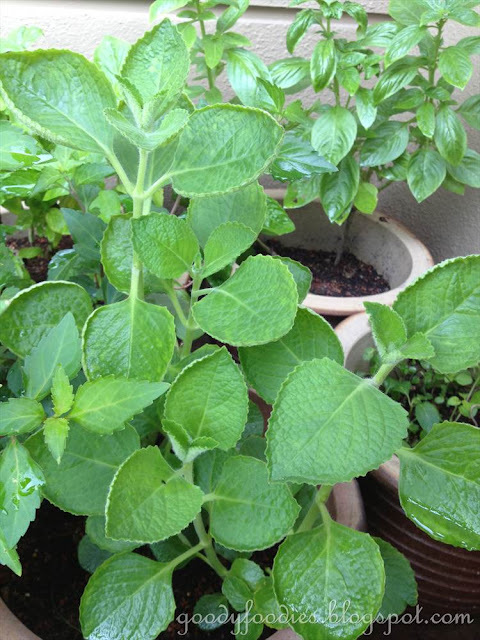 Lemon balm's leaves have a soft lemon scent. The plant requires partial sunlight and watered when necessary to avoid dryness. 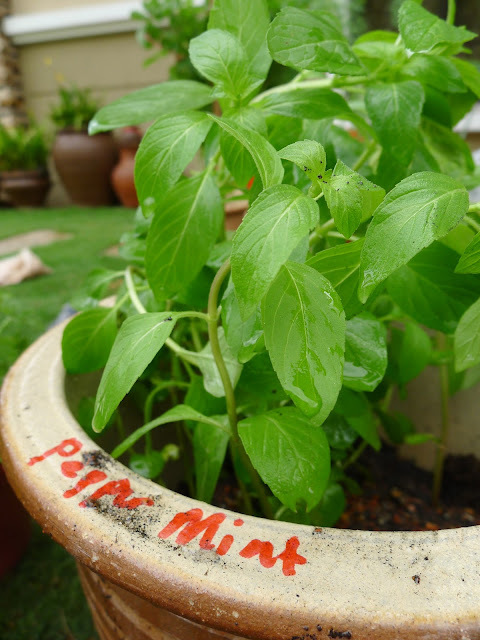 It is often used in making tea, flavouring ice cream or cakes or can also be added into salads, soup, stew, pesto (lemon balm pesto), and also as a repellent to mosquitoes when rubbed against skin. Lemon balm is believed to be an anti-depressant agent, as well as being able to relax the mind, aids digestion and relieves headache. This lavender herb is also known as silver edge lavender and looks very similar to rosemary, but the leaves are a much duller green (gray-green). It requires full sunlight with moderate moisture, so water when necessary. 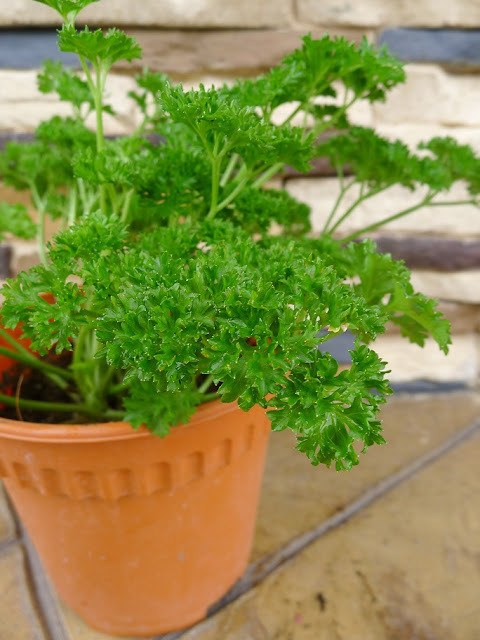 This curly leaf parsley is usually use as a garnish. The soil needs to be moist, so water twice a day especially when weather is hot. It has distintive double leaves which are aromatic, and is highly prized in many cuisines such as Thai, Lao, Cambodian and Vietnamese cuisine. The kaffir lime is rough and bumpy, and is quite bitter tasting. Good for cough and nasal congestion. Also known as sugar leaf or sweet leaf, it is used as a natural sweetener and sugar substitute. 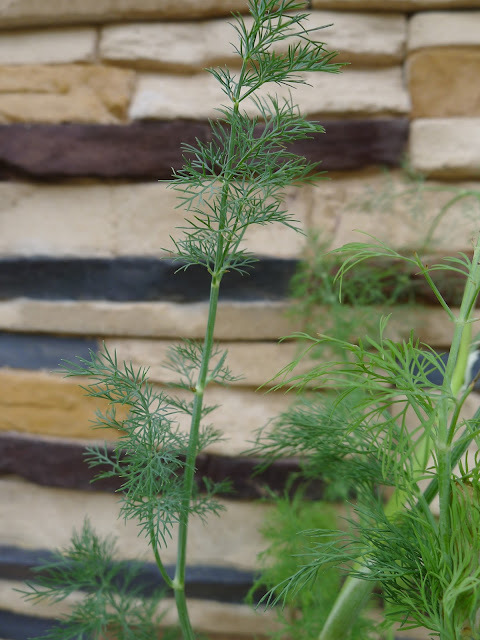 Fennel's leaves and flowers look very similar to dill, one of the easiest way to tell them apart is the bulb-like stem base that fennel has. The leaves are threadlike and has an aniseed flavour. 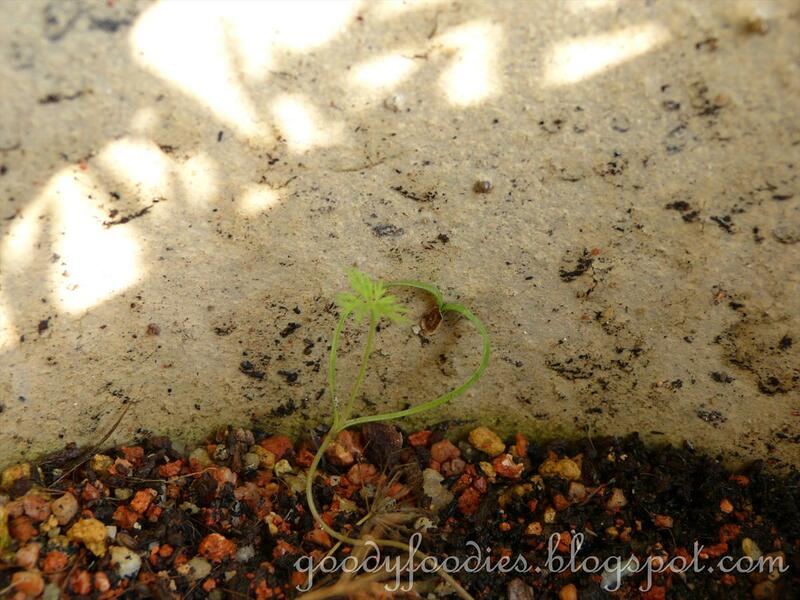 Fennel seeds are often dried and used as a spice (in Malay its called jintan manis). 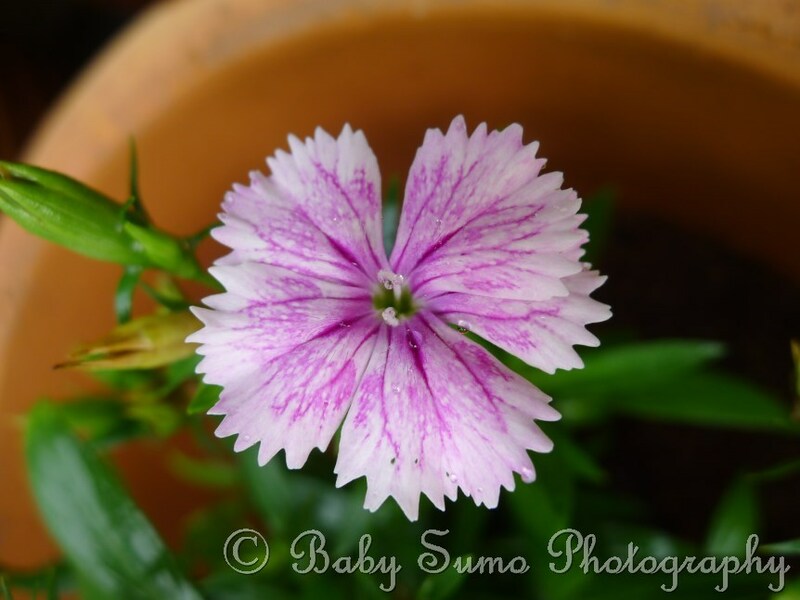 Flowers are pink. Fruits will be bright red when ripe, taste slightly tart. Should always prune to promote growth of new flowers/shoots.Water regularly and also spray insecticide. Mulberries (in Chinese "song yip") turn from green and furry to red to black when ripe. The leaves can also be eaten, it is said to be good for the eyesight and health in general. For more photos, click here. 1. If possible avoid buying the herbs from the supermarkets as the sudden temperature change once you bring them home may mean that they will not survive. If you do buy them from supermarkets, you need to ensure the temperature change is gradual (ie leave indoors for a couple of days in a cool place before you replant them outside). 2. I repot all my herbs when I bring them home. The herbs are placed at a shaded area at the back of the house. Most herbs receive morning sunlight. 3. For herbs, use coffee fertilizer. For fruit or flower plants, use chicken manure fertilizer. 4. 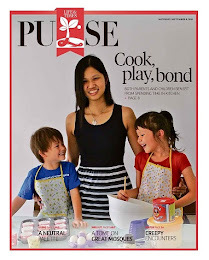 I have been getting lots of emails asking where to buy seeds for edibles in KL. You can try major supermarkets such as Giant/Tesco/Carrefour, or Ace Hardware. *Will be updating with more herbs when I have time. Thanks for sharing! 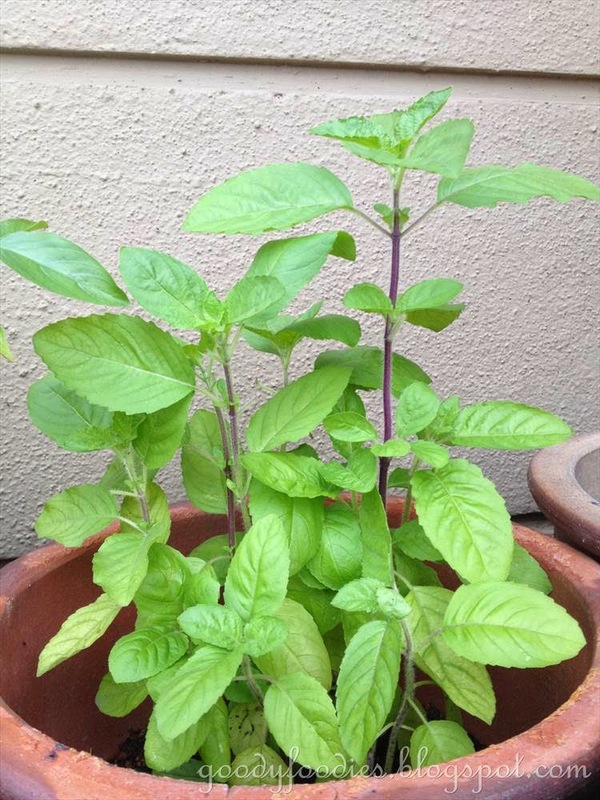 I have both sweet basil and Thai basil too, they're great! Hi, I wish to plant basils too, do you plant it from seed or plant itself? if so, where do you buy them? I thought u have sage too? I am so jealous of your herbs. I have basil, oregano, cilantro and chives. I bought them at a supermarket. Thinking if adding some more herbs. Where do you suggest I buy good herbs? I am really eyeing on buying a mint plant. 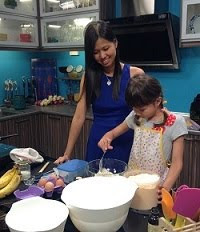 Hi Samantha, usually I get it from an aunty near the Cheras wet market. She will source it from Sg Buloh nursery for me. Mint is a good herb to have, and you can also try English parsley and thyme. 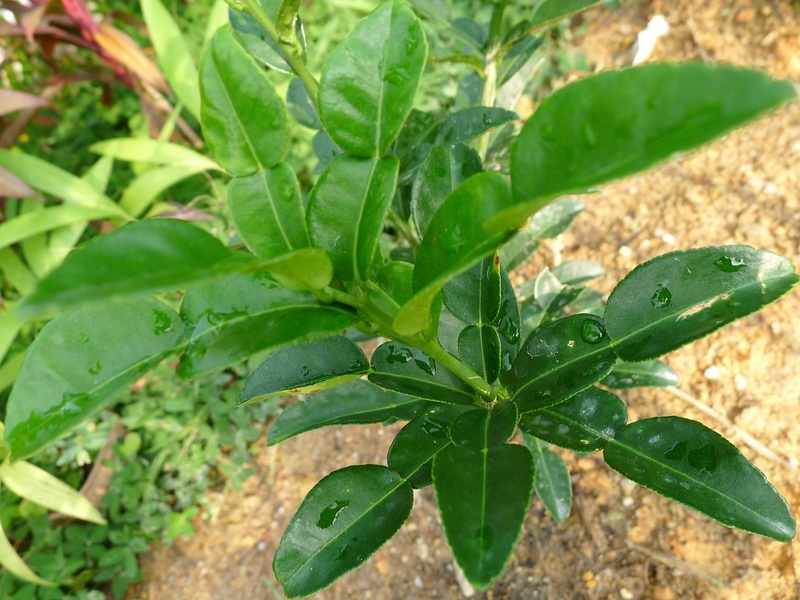 i have a limau purut plant for 22 years. In the beginning it flowered and fruit beautifully. After i started to use the lime/fruit for cooking, the fruiting seems to slow down and completely ceased. The plant till today is still growing very well , but still no flowering/fruiting. I use good organic fertilizer . Maybe you might assist me on how to get my plant to fruit again. Hi Emmanuel, perhaps you can try pruning/trimming the branches. I have been told that pruning will encourage growth of the plant and it may start flowering/fruiting again. Hope this helps. Hi there, you will be able to find most of these herbs in Sg Buloh nurseries or Genting Highlands or Cameron Highlands. Supermarkets will also have them but they may not survive in the hot climate (unless you're keeping them indoors near the window, then shd be ok). You can also plant from seeds, I found them in the pharmacy opposite Cold Storage in The Gardens Mall. Hope this helps! Unfor the only seedling blew over n died. 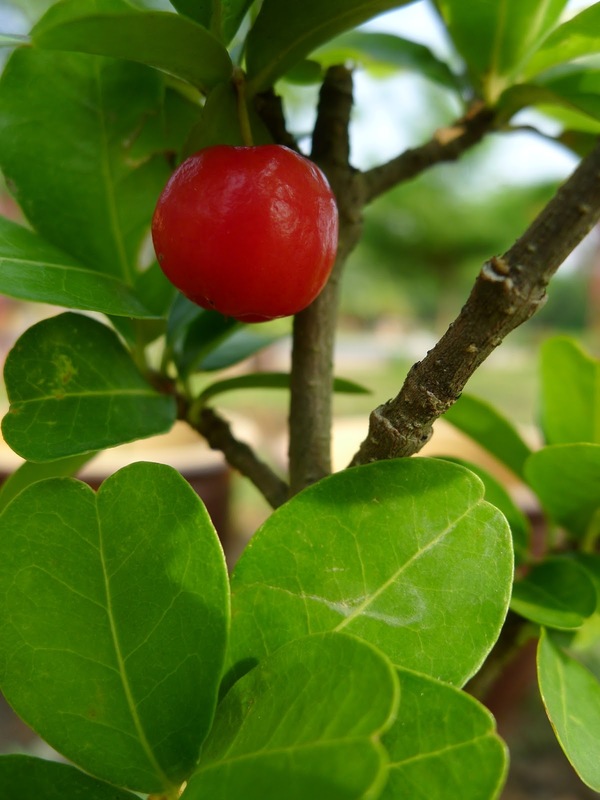 Hi there, acerola cherry is different from the cherries u get at the supermarket. It is quite sour in taste. 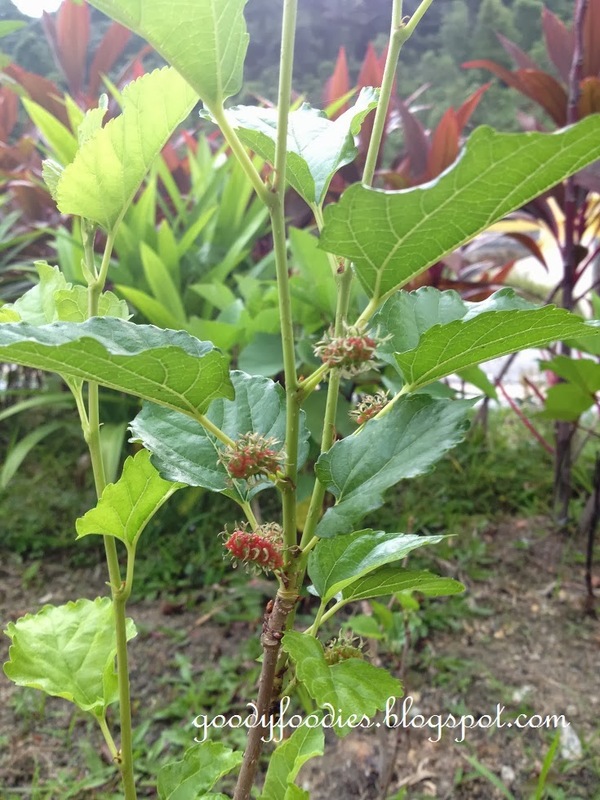 You may be able to find it in nurseries in Sg Buloh. Hi there, u can get herb seeds from various locations - some pharmacies (eg. the one opposite Cold Storage The Gardens), or Ace Hardware or even at Giant/Carrefour supermarket. Hope this helps! Hi, May i know where you buy the lavender? Am I able to get the lavender from JB? They will have it in Cameron Highlands or Genting Highlands. Hi, im pretty impressed with your herb collection. And i do appreciate the tips and guidance you gave inside your blog. I have three pots of basil, one dead rosemary (possibly due to overpruning and overwatering despite having excellent drainage), one sage plant, two snake leaf plants, and a spearmint. Hi, Happy New Year!! Love your herbs garden. Can I check with you how do you use dill with egg and cucumber? Thanks! Hi there, you can mix the dill in with scrambled eggs (add towards the end) or use in devilled eggs or on omelette. These are just a few examples, you can search more under label: eggs/herbs. Deeply impressed and I must say you sure are missy green fingers! I'm kind new to all this. May i know is this hobby expensive? I mean you need to buy fertilizers, soil, seeds, gardening tools etc and does it require high maintenance? oh one more thing, do you encounter any pest problem? Please shed some light. Thanks! Really lovely plants you've got growing here. May I know where you purchased them potted or as seeds? Hi Sephora, some are purchased as potted plants (rosemary, dill) and most of them I planted from seeds (parsley, thyme, basil). For potted plants, u can probably try Sg Buloh, for seeds, usually the larger supermarkets will stock them (Tesco/Carrefour/Giant) or Ace Hardware. I love the information you share in the blog. I am new to this hobby. I have an apartment with small balcony that is direct exposed to the sun after noon for 6 hours. Do you think this may affect the plant quality? What type of soil should I be using? Small pot... or can I mix two different type of herb in a long pot i.e. Rosemary with Kaffir Lime ? I'm not too sure, my herbs get morning sun and I water them 2x a day. You can probably try growing from seeds. I usually just use organic black soil and then fertilize it 2-3 times a month with coffee fertilizer. It is wonderful to see the herbs. If it is possible to ask you to help me gather as many herbs as possible? Sorry, if you are interested in getting herbs, you can pay a visit to the nurseries at Sg Buloh. Stumbled upon your blog today. So inspiring! I'd love to have my own lil herb garden. I'm very inexperienced when it comes to gardening, so can I get your thoughts on this? I live in a condo with a balcony, so space is limited. Do you think it will work if I had a long pot and planted a few herb plants in a row? Actually I have many friends living in apartments who have great success in growing herbs in long planters. You can probably start with basil, rosemary and mint first. Good luck! 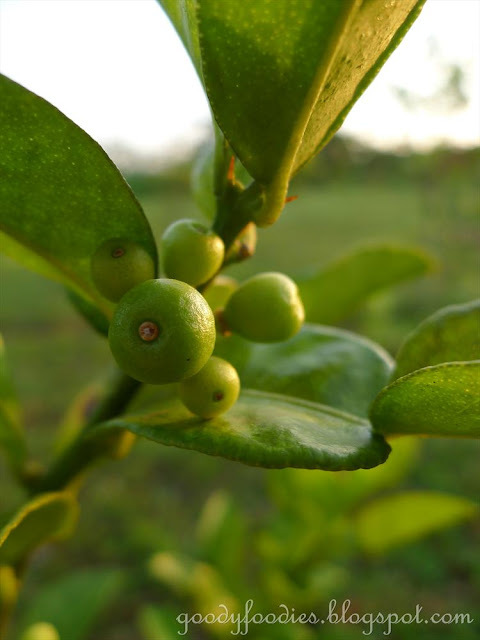 Hi, anyone knows where to get kaffir lime seeds in Singapore? Yes, in this hot weather, you will need to water them 2x a day. You cant really leave them unattended. Would like to ask you when you say coffee fertilizer for herbs, may I know which one are you referring to? Coffee sludge which is a low in nutrient fertilizer or NPK 888, a type of humus fertilizer? Hi there, I buy mine from a nursery, Im not sure what type is it... it's like small balls and they just call it coffee fertilizer, to be used on herbs. I grew my thyme from seeds, they're doing OK for the time being. You can get thyme seeds from Ace Hardware, it's definitely more weather resistant. To tell the difference rub your fingers over the leaves. 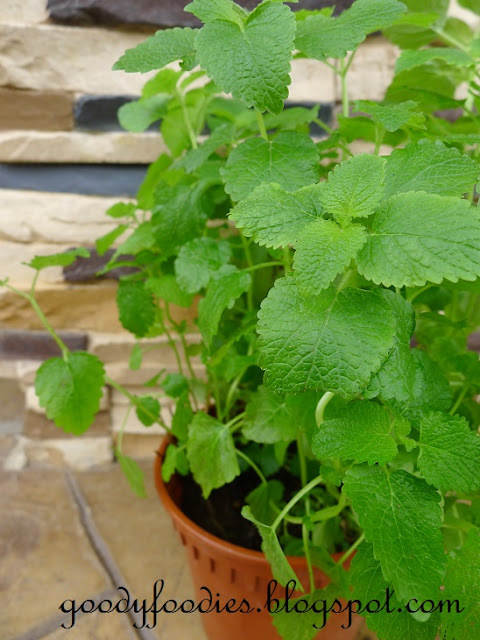 Lemon balm smells like fresh lemons and peppermint smells like your toothpaste (minty smell). Wah. Herb garden. It is something I always wanted to do. Hi there, I'm very interested to grow herb plants.... may I know where can I get these seeds (e.g., rosemary or pepper mint)? Hello! i can imagine you are living in such a wonderful environment, have some fresh herb whenever you need. haha I like that. Btw, i'm planting drill plant for 2 years however i found that my drill plant (all) just "died" with no reason especially when it come to year end, and i have to replant from seed every years, kinda frustrated on that, do you have the same experience too? any idea for that? and you mention the Pharmacy that opposite of Cold storage The garden, do you mean a real health pharmacy that selling plants seed? cos i'm planning to plant rosemary and thyme , so do lavender. Yea I find that my dill plant will die after a period of time, and I will need to replant from seeds too. Yea, the pharmacy opposite Cold Storage occasionally sells herb seeds. Alternatively you can try Ace Hardware in MV or others around KL. The white stuff is known as powdery mildew, which I think is a type of fungus. It is best to remove the infected leaves (trim), it will grow back dont worry! Hi, just wondering has your lavender bush bloomed so far? Cheers. I want to grow Herbs, Chilly, Lemon at home. Could you please advise me from where I can buy seeds and soil and what exactly I should be looking for as I am new to KL and Home Gardening. Do check out http://www.wellgrowhorti.com/shop/ for ideas planting media which you can opt for your planting needs. There are also seeds (flowers / herbs / vegetable) available. I was wondering if you know whether i could get Mint Seeds anywhere or are they only available via cuttings? Hi, I hv a garden of mint. Will be glad to gv you fresh cuttings but I'm based in Melaka. If you're down in Melaka, go to Big Nyonya Restaurant(google pls, ya?) & ask for Ms. Fern's contact for mint plant. I'll bring some over for you then. You can try Ace Hardware, they usually have herb seeds for sale. Believe I've seen mint before. If you have friends who have mint plant, you can ask for some cuttings, as they grow very easily. (1) Where do you get the seeds for edible flowers and mulberries within Malaysia? (2) Have you planted western spinach ? I have difficulties in germinating, wonder you have come across that ? Hi Thanks for the info .. The plants look great. I have been trying to propagate sage from cuttings however the stems always get black and dies off.I usually I hae tried using rooting hormone but not successfull. Do you have any suggestion on how to grow sage in our weather..
Hi there! i just want to ask do u by chance know any shops in Ipoh that sells herbs or its seeds? hi there... may i know which nursery in sg buloh that you go to? Looking for one with a lot of herb plants and also sell the coffee fertilizer. Hello! I'm jelous of your garden the plants are beautiful! May i know where did you find the Indian borage plant? Did u grow them from seeds? Anyone knows where can I get rosemary seeds? 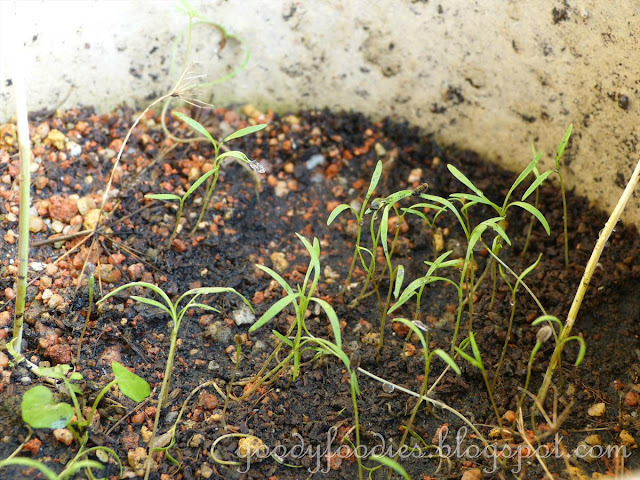 How to maintain the coriander plant which is already planted from its cuttings ? 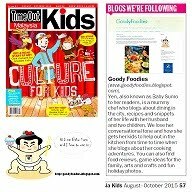 Hi Baby Sumo....I like your blogspot. Very neat. Can you advise me where to get holy basil? 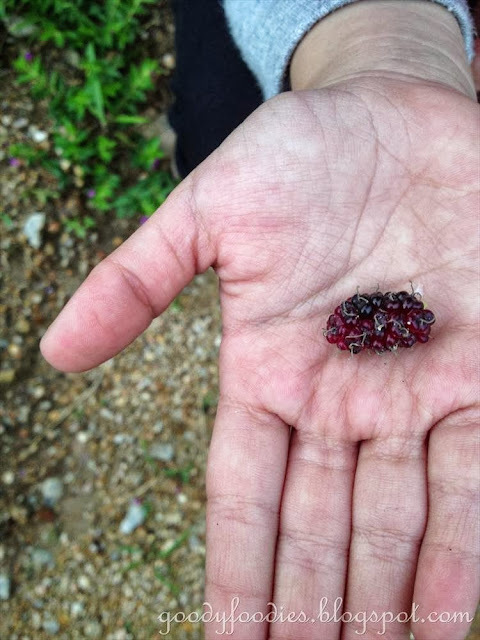 ...locally in Malaysia, what does it called? How did u grow indian borage ?? Any advise on where to get it ? Any place to sell lemon thyme seed? Hi, how many time should we water the lemon thyme? It should be partially shade or full sun light? I just newly bought my lemon thyme from supermarket but after just a few days it seems like turn black and dried up even I water the plant everyday and put it indoor. What should I do? HI, anyone know where to buy local buah delima in Malaysia? All these herbs can be planted here in Malaysia - THANK YOU for telling all this. Great info for me. Hi Is there anywhere near Cheras that I can buy mint plant? Hi, I have started herbs planting last year too. However sage seems like not growing well. T.T may I know you started them from seeds or matured plant? Hi Deb, for the sage, I bought a matured plant from the nursery. From seeds, I've planted dill, sweet basil, Thai basil. Hi. I would like set up herb garden at my house roof top. Somebody can guide me how to do ?